and a zipper pouch for loose papers. Toward the end of last year I decided that it was time to overhaul my planning system. I have been using a Slingshot Organizer since 2003 and while I absolutely love this planner, even with the larger size it still didn't quite have enough room for everything I needed it to hold. Around last June my Slingshot disappeared and after a few weeks of hoping for its reappearance, I gave up. I started using Google calendar exclusively as my planner and carrying a small notebook for lists. Long story short, I hated it. I felt scattered and unorganized and while I loved Google calendar's push notifications, I hated my interaction with it and that many times I wouldn't realize the thing was happening until an hour before which resulted in several panicked rushes to a place for a thing. Basically I learned that I need a paper planner with month and week views that I can keep with me. I need a planner that can't access Facebook or Twitter, I need a planner that won't interrupt what I am doing with text messages and most importantly, I need a planner that I want to interact with. I started looking at Filofaxes, the holy grail of the planner community. I had a Day Runner all through college and had it not been for my simplification to the Slingshot Organizer I probably would have upgraded to a Filofax shortly after. 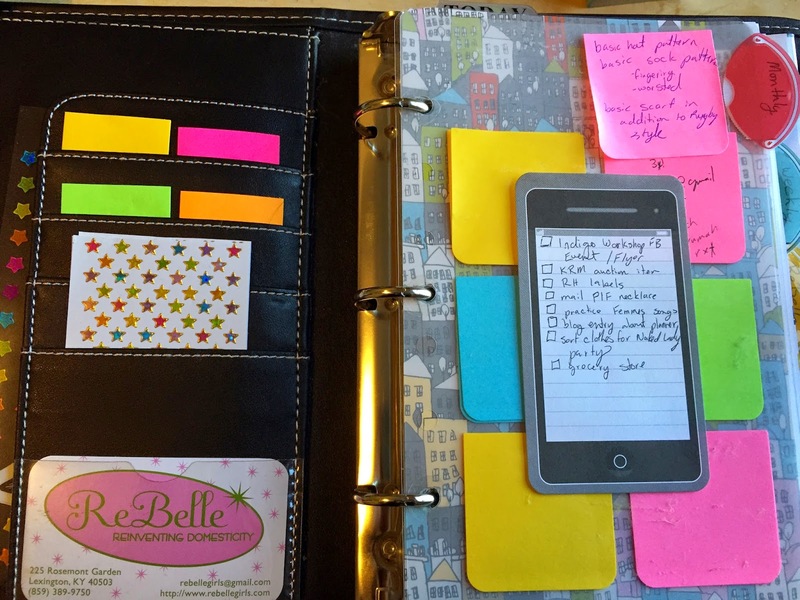 A quick Google image search for Filofax planners yielded thousands of beautiful images of personalized planners, I thought "this is for me." I then started watching YouTube videos of different set-ups, systems, and decorating tips and quickly became overwhelmed. Then I started looking at the non-leather filofax options which were totally disappointing so I looked at used leather versions- of course the one I really liked was a rare model going for three times its original price on ebay. I decided before I spend several hundred dollars on a planner that I might or might not like, I should test run a cheaper model. I knew the A5 was the right size for me so I started with a half-sized three-ring binder I had leftover from a work training years ago. I bought some dividers, blank calendar pages, and some washi tape (the filofax world is all about the washi tape) then started searching the internet for printables to add to my planner. I spent hours putting the thing together and decorating the calendar pages for the first few weeks. I quickly realized that while it looked great and made me excited to use it, there is no way I can devote this kind of time to a tool use to manage my time. I needed something easy but still nice to look at. My second series of decorated pages after I added the Spiraldex. Then I discovered the Chronodex, a visual time management tool, and its more aesthetically pleasing (at least to me) cousin, the Spiraldex. 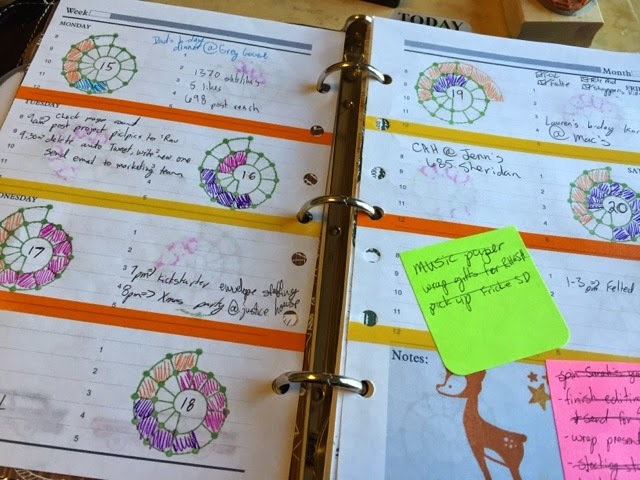 As a visual person, these systems work very well for me and in addition to mapping out my time visually they add a bit of decoration to the planner pages, something that I am obviously not going to do. After a week of using the little spirals pasted into my planner, I was sold. I looked into buying a stamp of the spiraldex from the creator, but he has been "working on it" for what looks to be well over a year (insert time management joke here.) Anyway, I sent the image to a stamp company and within a week I had the stamp in my hand, perfectly sized for my planner. I used the stamp on plain planner pages for a couple of weeks, but I still longed for the decorated pages. I looked at several options on Etsy, but nothing suited me- Saturdays and Sundays are always smaller than the other days, apparently organized people have lazy weekends. Larger weekend days were one of the many things I loved about my Slingshot planner and at this point I was considering going back, but I was already getting used to all the other systems I had set up in my planner, it was just the weekly and monthly planner pages that I couldn't seem to get right. Then it dawned on me- why not put the Slingshot pages into my new planner? 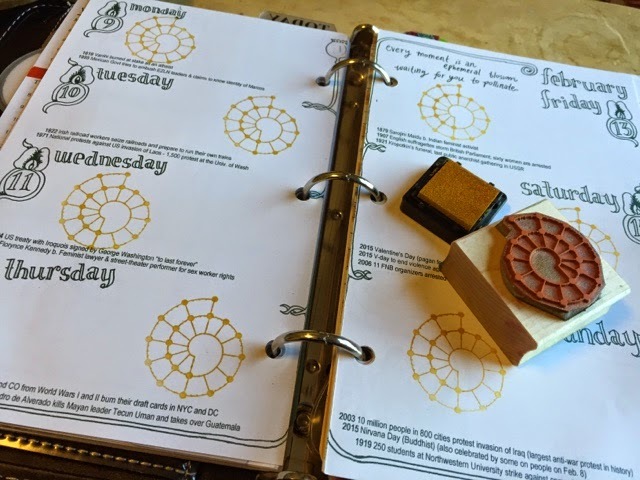 It was simple and perfect- the pages are already decorated and my spiral stamp fits perfectly into the daily cells, plus there is the bonus of me already being comfortable with the layout. Just stamped naked pages and my custom stamp. This is what everything looks like at the beginning of the month. And here is what the pages look like when they are in use. So for the last month I have been using my modified Slingshot Organizer and so far I am really happy with it. I love the way it looks and I love the little daily facts and date reminders and most of all I like that there is a little anarchy hidden amongst the organization. Anyway, I thought I would share my system since I learned a lot from seeing what others are doing. Also I created a few custom printables that I will share in the coming weeks so stay tuned. Can you share the name of the company that made your stamp please? I used http://www.rubberstamps.net/ for my stamp and after a year of use it has help up really well.